1. Combine onion, tomato, chiles, chili powder, and 1/2 of Italian dressing in microwaveable bowl; microwave 4 minutes or until vegetables are tender. Stir in cilantro. Sprinkle 1/2 cup cheese on 1/2 of each tortilla and top with 3 tablespoons vegetable mixture. 2. Brush outside of tortillas with remaining dressing and sprinkle with a salt-free seasoning for color. Microwave open-faced 1 minute or until cheese melts. 3. Add 1 to 2 tablespoons sour cream to each tortilla, fold in half, and serve. 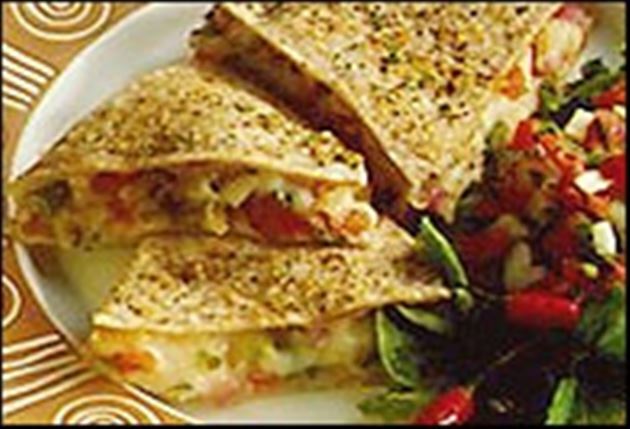 Enjoy this delicious veggie quesadillas Mexican recipe!